How has our defence all of a sudden become "great" with the addition of Abate (if he does indeed play there)? He is a mediocre player, not good enough to start for the team in his normal position of right wing, let alone at full-back where his defensive inadequacies will be highlighted. Our defensive problems stretch further than just the defence. The midfield are playing their part too. I think the backs are to rotate exactly how we are doing with Oddo, Jankulovski and Abate also same as is training and could get to make the quarterback. So it's clear now Leo is not a ****** he is trying to make everything worked with the most minimal risk that he can possibly think for the team. So where exactly do you fit wingers in our central 4-3-1-2? I didn't say he could fit into our system. I simply said that he is not good enough if he were to start in his preferred position. Leonardo used him in the middle in pre-season, and indeed when Oddo came on in today's game. So there is the answer to your question. hard-working, fast fast, We have some other guys that can run with him too. Last edited by Hassan; 21-09-2009 at 06:04. 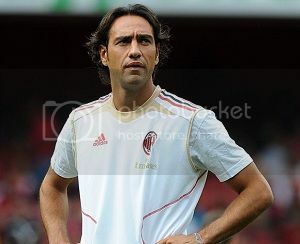 Flamini+Abate is a good example...great work by Abate in this game. Last edited by ladro; 21-09-2009 at 14:24. Abate is the best temporary solution to Milan full back problems but in the long term we should seek another alternative Abate is too aggressive to be defender he spent most of his time in the Bolonga game in the opposition final 3rd it was sheer madness. whatever happens it looks like oddo and dida time at Milan is coming to a end all Galliani has to do is find a club crazy enough to buy these players. No I'm not kidding. I've seen him play lots of times. I don't think you have, because you wouldn't be saying he is good enough otherwise. Most of this forum haven't seen him play either.